The Thermo Scientific Forma 3950 Reach-In CO2 Incubator has a roomy, durable 29 cubic feet interior well suited for well suited for short term growth studies, large experiments, long term bacterial growth and storing valuable samples on a long term basis. The spacious interior can easily accommodate shakers, bioreactors and other similar equipment in an environment that’s tightly controlled. Power cords, sensors and probes can be set up within the Thermo Scientific Forma 3950 Reach-In CO2 Incubator via two thru-wall access ports positioned on either the right or left sidewalls. Automatic Elevated RH at reach-in protects against desiccation in medium-term cultures, and maintains temperature uniformity even when equipment is installed within the chamber. By using true lamina airflow, the directed air circulation avoids the challenge of fully loaded shelves deteriorating uniformity and recovery. The Thermo Scientific Forma 3950 Reach-In CO2 Incubator has three water fill options to help minimize frequent refilling, automatic, semi-automatic and ergonomic manual. The water reservoir is externally heated and high capacity. The stainless steel interior seats 5 heavy duty stainless steel shelves that are corrosion resistant and swivel locking casters for easy mobility, leveling feet for stability. The Thermo Scientific Forma 3950 Reach-In CO2 Incubator features an intuitive message center, with bright displays for ease of monitoring parameters. Controlled by a microprocessor, temperature and CO2 levels are constantly displayed the Enviro-Scan Message Center. From this center the user has access to system configurations such as H2O alarms, access codes, Audible/Visual alarms, Relative Humidity, and Display CO2. 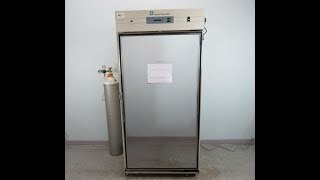 Dimensions (L x W x H) 32x38x80"
The Thermo Scientific Forma 3950 Reach-In CO2 Incubator is in excellent working condition and comes with our standard warranty. This enivormental chamber has been tested and calibrated per the manufacturer's manual. Please note there is a slight blemish on the side, this does not impact performance. If you have any questions please don't hesitate to give us a call.